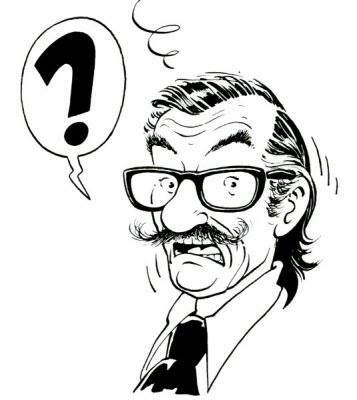 In 1990 “Professor Sató’s 3 Formulae, Volume 2: Mortimer vs. Mortimer” was published, it was the twelfth book in the Blake and Mortimer series and although started by Edgar P. Jacobs, it was Bob de Moor who completed it after the death of Jacobs. Although lots has been written about it since – the general remark has been that given enough time and more freedom, de Moor could have delivered an album superior to what had to be rushed to meet the deadline (and it seems like it that also the last Blake and Mortimer album “The Septimus Wave” suffered the same ordeal as you can see in the huge difference in quality between the first part and the second part of said album). 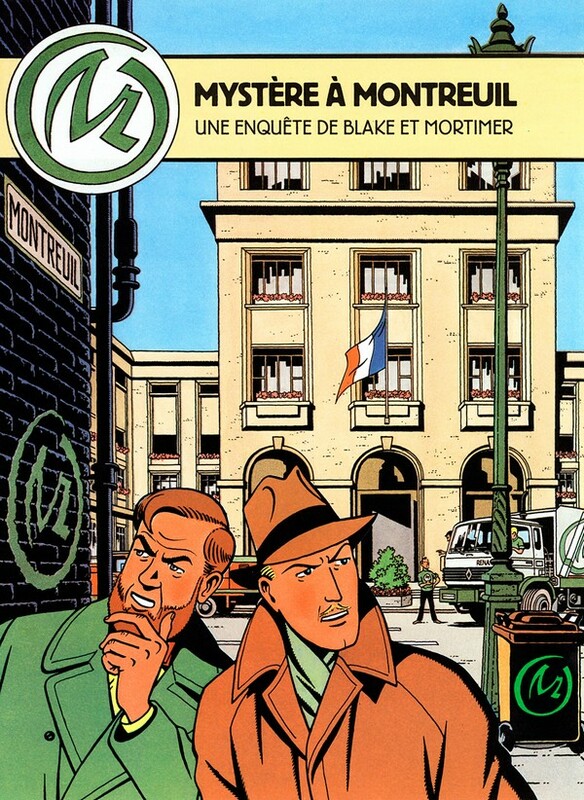 But… in 1988 already de Moor had created a 4 page story for Blake and Mortimer, called “Mystère à Montreuil” aka “La Marque Verte” (The Green “M”) using a big green “M” which stood for Montreuil of course. The story was clearly a pastiche on the 1956 album “The Yellow “M”” but unlike his previous pastiches this one was in the most popular clear line style of Edgar P. Jacobs. 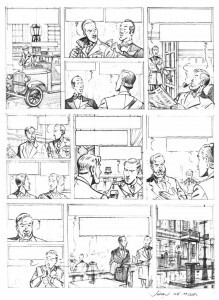 The 4 page story can be considered one of the oldest communication campaigns ever done using the characters Blake and Mortimer. The 4 page brochure was realized by Bob de Moor for the french city of Montreuil and has as sole purpose to promote the cleanness of the city. A comic drawing contest was also organized and all of the 100 who won received “The Yellow “M””… quite strange, you’d expect them to have won the “La Marque Verte” 4 page story instead. 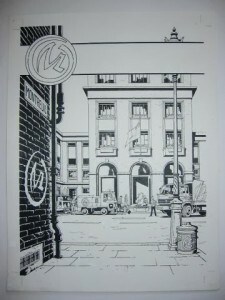 You can download the 4 pages “Mystère à Montreuil” aka “La Marque Verte” right here . It also includes an original plate as drawn by Bob de Moor of the second page. Note that it’s our guess (and we are 100% sure actually) that Johan de Moor also collaborated on this project, especially for the decors. You’ll especially recognize a typical Johan de Moor style of drawing people in cage 4 of the 2nd page. Johan de Moor would in 2009 also make a pastiche of the “The Green “M”” album cover for the cover artwork of the Belgopocket guide using his father’s Balthazar in front of a yellow question mark. Speaking of Johan de Moor. It didn’t stay just with that Blake and Mortimer adventure and a cover for the son of Bob de Moor. 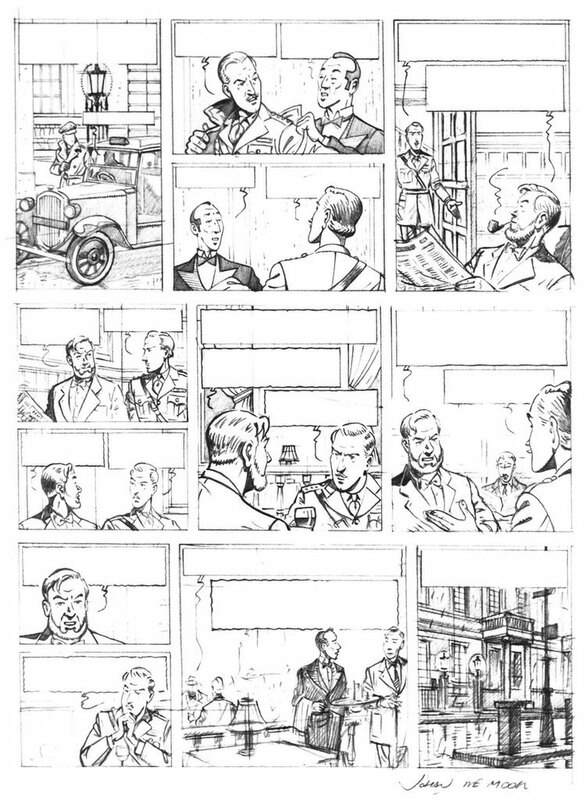 As it seems Johan de Moor was one of many who wanted to take over the Blake and Mortimer series. The proof: on February 7th 2010, a Blake and Mortimer test page in crayon was auctioned at the french Kahn-Dumousset auction house. You can see that page on the left. A rarity which not many people are aware of. We’ll get back on this once we have spoken to Johan de Moor. 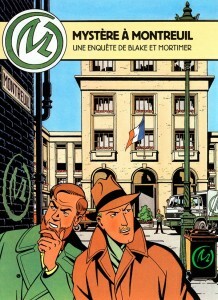 Special thanks go to the now defunct Blake and Mortimer blog for the scans of the “La Marque Verte”.